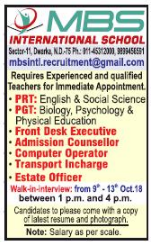 MBS International School, New Delhi has advertised in THE HINDUSTAN TIMES newspaper for recruitment of Teachers PGT jobs vacancies. Interested and eligible job aspirants are requested to walk-in from 09th to 13th October 2018. Check out further more details below. About School: MBS International School, a living school of excellence. It provides a natural, holistic, student centric environment that empowers and inspires the mind, body and soul of all our students. With state of the art facilities, air conditioned classrooms, MBS offers a comprehensive curriculum where every child, from pre-primary to class Xll, can develop self-esteem, self-confidence and achieve their full individual potential.